The city of Valencia boasts more than 21 centuries of history, dozens of monuments from every era and three World Heritage properties: the Silk Exchange (Lonja de la Seda), the Water Tribunal (Tribunal de las Aguas) and the Fallas (annual festival featuring ephemeral art, fire and fireworks). Few destinations in the world can boast three different cultural attractions on the prestigious UNESCO list. This cultural walk covers Valencia’s most essential, must-see sites, with a professional guide sharing the city’s many stories. The North Station, City Hall, Central Market, Silk Exchange, Queen’s Square, Virgin’s Square… Our steps will take us down the streets and through the squares of the Historic Centre, as we discover how this urban network has evolved over the centuries: from its Roman origins, through the Muslim period, the Christian era, and down to today. We will enter the Lonja de la Seda (Silk Exchange), a masterpiece of Gothic civil architecture that was declared a World Heritage Site in 1996. The fabulous Trading Hall with its columns, vaults and ribs will transport us back to Valencia’s prosperous Golden Age. The Water Tribunal, declared Intangible Cultural Heritage of Humanity in 2008, is re-enacted every Thursday at noon at the Cathedral’s Door of the Apostles, while the Fallas was Valencia’s last addition to this UNESCO list, in 2016. These festivities are held between March 15 and 19, turning the city into an open-air museum of ephemeral monuments, accompanied by music, traditional attire and the scent of gunpowder. 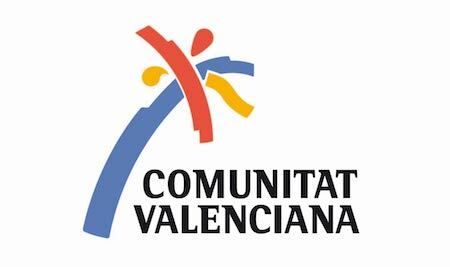 “Essentials of Valencia and its World Heritage Sites” constitutes an exclusive journey through the city’s great wealth of culture and heritage, which has garnered it three-fold recognition by UNESCO. Don’t miss out on the chance to enjoy this tour through Valencia’s past and present, a unique opportunity to ensure great and lasting memories of your visit. The tour includes admission to the Silk Exchange (every day) and the City Hall (working days, except when official events are held). From Monday to Friday we also offer the possibility of ending the tour in the best possible way: with a tasting of Valencian wines in a unique enclave in the very heart of Valencia. This option includes a tasting of two wines with an approximate duration of 1 hour. The guide will accompany you to the space. You only need to choose the option “with wine tasting” when booking the visit. 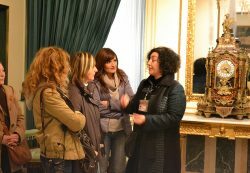 For scheduled tours available in English, you can book your places here. For scheduled tours not available in English or other activities, please contact us by email (info@turiart.com), phone (+34 963 520 772) or WhatsApp (+34 657 047 739). Every day (except for Jan 1st, Jan 6th, Apr 19th and Dec 25th 2019). Tourism Hub at Estación del Norte (North Station, main railway station), Valencia. West Tower (the one on the right hand side when facing the station), Ground Floor. Carrer de Xàtiva, 24. Metro station: Xàtiva. A family tour for true knights, princesses, princes and warrioresses. An activity that will take us to Medieval Valencia from the hand of a guide that has arrived from that time. "Palaces of Valencia" is a cultural tour that will take us to the city's most noble past. Let us guide you through baroque halls, monumental staircases and the most astonishing decor. 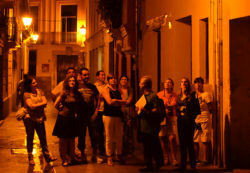 Tradition or myth, history or legend… Do you dare to discover the hidden memories of the city on this night-time tour?